Not all Pet Feeders are created equal. This feeder is designed with both elegance and functionality in mind. It aids digestion by encouraging your pet to maintain a healthy posture while eating. It also allows your pet to eat in style. It features two large, supremely crafted stainless steel bowls Below the cabinet has an area for the storage of items of your choice. This Richell Wooden Pet Feeder will compliment your home’s décor versus being an eyesore. The handcrafted, durable wood construction is enhanced by a beautiful and elegant dark brown finish. 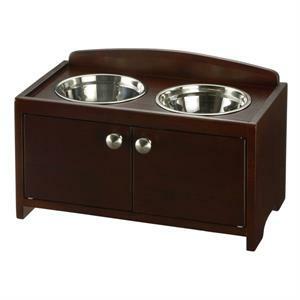 2 Stainless steel bowls 7.1" in diameter x 2.4"
the cabinet is to organize toys, treats, leashes and much more!